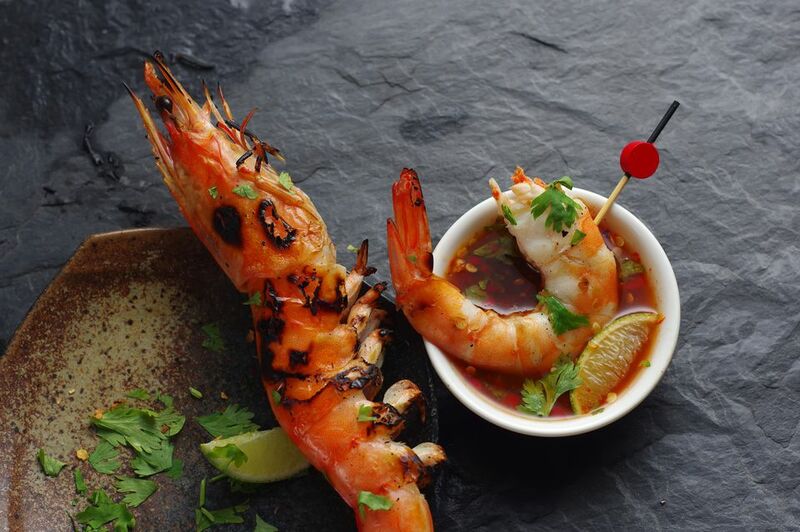 Use Thai BBQ sauce on everything from seafood to vegetables. Homemade Thai barbecue sauce, also known as sweet chili sauce, is easy to make and far superior to store-bought varieties. It's a dark, tangy-sweet sauce that can be used as a marinade, stir-fry sauce, or dipping sauce, and has just enough spice to give meat, poultry, fish, shellfish, ribs, veggies, or just plain old burgers a flavor boost. Brush it on salmon or shrimp while grilling for a taste sensation. The sauce is made with common Thai ingredients like oyster sauce, fish sauce, and fresh or dried Thai red chili (bird's eye chili pepper) that can be found in the ethnic aisle of most grocery stores or at an Asian market. The beauty of this flavorful sauce is that its heat level can be adjusted by using more or less of the red chili pepper. Double this recipe so you will have enough to drizzle over the finished dish before serving. It's also delicious over rice or potatoes. In a medium bowl, combine the oyster sauce, ketchup, molasses, fish sauce, lime juice, honey, garlic, ginger, and chili. Stir together until they are well blended. Taste the barbecue sauce, adding more honey if it is not sweet enough, or more lime juice if it is too sweet or too salty for your taste. Add more chili if desired. Use as a marinade, stir-fry sauce, or dipping sauce over meats, seafood (especially salmon and shrimp), and veggies. Store this sauce in a covered container in the refrigerator for up to two weeks. The most popular pepper in Thai cuisine is the bird's eye chili, a small, slim pepper that is 20 times hotter than jalapeno peppers. Chili peppers, originally from the Americas, were introduced to Thailand by the Portuguese and Spanish in the 16th or 17th century and, along with rice, have become two of the most important ingredients in the culinary repertoire. If you can't find fresh, crushed, or dried bird's eye chili, substitute fresh, crushed, or dried red cayenne pepper.